Yes my friends, despite having a steady nine to five, I am a Starving Artist. Much to my shame / embarrassment / guilt, it’s time to be completely honest and admit I don’t know how to run a business. Consequently, what few dollars I’ve made from the sales of my books, don’t add up to what I’ve spent or the debt I’ve accumulated while “investing” in my art. Granted, my money management skills weren’t the best to begin with but to an already difficult to handle situation, I tossed in the attempt at being a one woman publishing house in order to produce my books. I spent (and lost in one instance, shady web designer ran off with my money) money on printing, web hosting, web design, book launches (just one, but it cost me over $700.00), and other marketing materials and events when perhaps I would have been better served putting that money toward bills, groceries, or savings. I keep reading all this fluff about “going for your dreams”, “don’t give up, success is just around the corner”, etc. I don’t know about other creatives, but I can dream all I want to, that’s not putting food in the fridge. 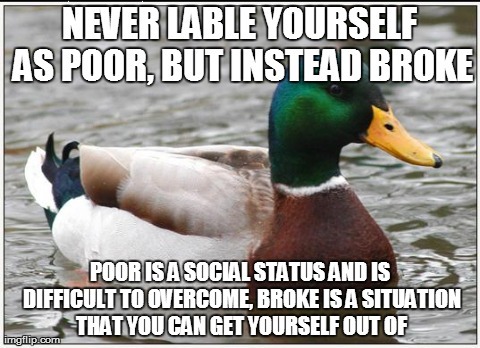 Nor is it helping me get out of the financial hole I put myself in while going for the “dream”. There’s something missing for me between the rah-rah speeches and reality. So, what do I do? The money thing as it stands has to be dealt with. I want to be debt free by the end of June this year. I’ve crunched the numbers and in order for that to happen, I’ve got to live these next few months like a monk. No spending on anything except bills, debt, and food. I got rid of cable last year, and for the next few months, I’m cutting off internet at my house (hate Comcast anyway so that’s not that big of a deal). I imagine all of this austere living will do wonders for my waistline as there will be no eating out and no extraneous spending at the grocery store, not to mention fewer hours spent sitting on the couch vegging out while I surf the web on my laptop. I’ve got a list of expense-free things I can do while in my cell at the monastery – begin those Portuguese lessons, finish the three novels currently in draft form on my hard drive, finish the Purge (I have a ton of stuff that can go – would love to sell it but selling things doesn’t seem to be my forte yet). I can practice standing on one leg so as to improve my balancing skills – they say as you age, your ability to maintain your balance can deteriorate. Who knew? *ahem* Here’s where I get to the point of this post. I’m going to use this time to once and for all, figure out just what my end game is. I’ve got this vague idea on where I’m trying to go with my art but nothing set in stone. I’ve been trying to reach a target I can’t see clearly. No wonder my attempts then have been hit and miss – mostly miss. There are a ton of resources, free even, that I could tap into but first I have to know what it is I’m going for, so I can best discern what help I need. Quick endorsement here – Dangerous Lee (aka Leigh Langston) is making a business out of helping “starving artists” build their web presence to the point where they can make livings doing what they were born / driven / called to do, be it painting, photography, graphic design, writing and performing music, or writing books (click here for info). She shares all kinds of information through her blog posts so be sure to add your name to the email list – you’ll get a free resource guide to start, then be privy to first hand tips and such going forward. Her initial analysis of my blog provided me with a step-by-step guide on how to increase visibility. I’ve made three of the changes so far and have seen an increase in the number of views already. I hope that come July 1, 2015, I will be reporting the grand opening of Dana Ellington, Inc., a fully solvent business ready to sell you quality products and services all geared toward building self-awareness and love. You dont know what this post means to me. Thanks! More to come.